Ankylosing spondylitis (AS) is a deep-seated immunological disease, which requires treatment at a deeper level. The conventional treatment alone is not enough in most cases. Added homeopathic medication is strongly suggested for better control and long-term management. It calls for internal, deep acting homeopathic treatment. Dr Shah's Research proven homeopathic treatment offers encouraging treatment for AS (Ankylosing spondylitis). 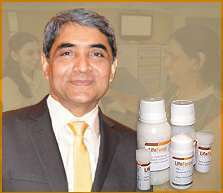 Dr Rajesh Shah's treatment entails his Patented product along with traditional homeopathic medicines, which give the best possible results in treating Ankylosing spondylitis. The individualized treatment is based on the study of patients patches, extent, cause, genetic pattern, emotional sphere, the extent of tissue damage, and other factors which lead and maintain the disease. Dr Shah has worked on Ankylosing spondylitis and other related diseases for over two decades and his patients in over 160 countries have been benefited.